Extron Electronics is introducing the AXP 64 C AT, an audio expansion processor with six mic/line inputs and four line outputs for remote connectivity to a Dante-enabled DMP 128 audio system. It is used to place six mic/line sources onto a Dante audio network, and route any four Dante channels from the network to an amplifier or other destination. The AXP 64 C AT features Extron ProDSP with gain, filtering, and dynamics processing for all inputs and outputs. Four of the inputs also include AEC, 48 volt phantom power, and control ports. FlexInputs offer the additional capability to process Dante channels in place of the first four local inputs. A single Ethernet cable from one AXP 64 C AT, or several linked units, to a central equipment rack greatly reduces the effort and expense of pulling one cable for each endpoint. "Integrators need a way to eliminate the effort and expense associated with pulling multiple cables to the digital signal processor in the equipment rack from the microphones and audio amplifiers in the meeting space," says Casey Hall, Vice President of Sales and Marketing for Extron. 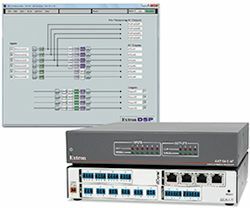 "The AXP 64 C AT routes signals from the meeting room to one or more DMP 128 AT Digital Matrix Processors on the Dante network but also receives and processes signals back to the room from the network all using a simple Ethernet link." The AXP 64 C AT includes four independent channels of AEC with advanced algorithms for fast convergence and optimal intelligibility in conferencing applications. The AEC-enabled inputs also offer FlexInput capability to route a Dante channel through the processor in place of a local mic/line input. The flexible input selection enables the AXP 64 C AT to process audio from remote wireless microphones, wallplates, and other sources from anywhere on the Dante network.